Locals, visitors and foodies alike look forward to the annual Outer Banks Taste of the Beach weekend! 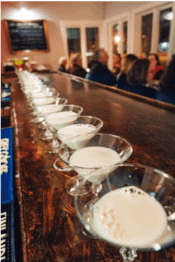 A four-day, food and drink centric weekend hosted by the Outer Banks Restaurant Association highlighting the best fare of many local restaurants. With more than 50 events, ranging from multi-course wine dinners, tapas crawls, to intimate cooking classes with some of our local talented chefs, and more events to choose from, we thought we would offer some information to help you choose! Bring the family! All are invited to enjoy the sunset, live music by Jeremy Russell, and an outdoor showing of Ratatouille under the stars, to kick off Taste of the Beach weekend. Local food and beverage vendors, and local artisans will be there showing off their products. There will be a 50/50 raffle and live auction of gift certificates to some of the best restaurants of the Outer Banks, with all proceeds going to the Beach Food Pantry. Admission is free with a canned food item, or a $3 donation to Beach Food Pantry. Learn More. 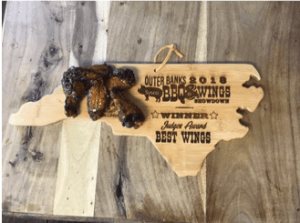 The annual showdown will feature fifteen area restaurants cooking up their best pulled pork barbeque, ribs, and zesty chicken wings, along with other smoked specialties that may include everything from barbeque tacos to area specialties such as barbeque shrimp. The ticket includes all-you-can-eat samples, as well as three-ticket access to the beer garden. Stick around to vote for the best barbeque on the beach! Buy Your Tickets Here. This grand finale event is the most popular and longest running event. This must attend event will give you the culinary experience of a lifetime. Taste samples from over 15 different restaurant booths, and enjoy the Bartenders Bubbly Bash, where local bartenders will be mixing up their signature sparkling wine cocktails for you to taste and vote on your favorites through cash tips. All tips will serve as votes and proceeds will be donated to the Beach Food Pantry. Restaurants will be competing for the 10th Annual TOB’y Awards: Best Booth Presentation, Best in Show, and the two most coveted awards, the Chefs Award and the People’s Choice Award, all to be announced at the end of the event! Buy Your Tickets Here. Buying Tickets With over 50 events taking place over the weekend, it is impossible to choose! Luckily, the Outer Banks Restaurant Association’s website for the weekends events, www.ObxTasteoftheBeach.com, makes it easy for you to browse events and plan out your food-filled weekend! You can browse the website by event day, restaurant, category or event town. Be sure to purchase in advance, events will sell out! 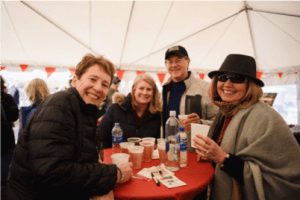 Tickets for any of the Taste of the Beach events, that have not yet sold out, will also be available for purchase at the Locals Night at the Soundside on Friday March 29th.